Anti-Inflammation Diet for Dummies is written by Dr. Artemis Morris, a naturopathic physician and nutrition instructor and Molly Rossiter, an award-winning writer. This book was written for those who want to reduce the inflammation in their bodies, which is often a contributing factor in the development of chronic disease. The authors explain what inflammation is and how it affects your body, the role it plays in chronic illness, how you can eat to reduce inflammation, the top foods for fighting inflammation and provide a selection of recipes for every meal of the day. Low-grade inflammation is a condition inside the body that can facilitate a range of chronic diseases including arthritis, obesity, heart disease, allergies, asthma and cancer. In this book a preventative way to fight inflammation is outlined involving the use of anti-inflammatory foods and nutritional supplements. Readers are provided with a nutritional breakdown of different foods to increase their understanding of how diet influences the development of inflammation. You are guided on what foods are best eliminated from your diet as well as the best foods to eat to reduce inflammation. General recommendations for an anti-inflammation diet include emphasizing natural and unprocessed ingredients, avoiding gluten, and increasing your intake of fresh fruits and vegetables. A list of the top ten inflammation-fighting foods is also provided. Foods to be avoided include those containing trans fats, refined carbohydrates and artificial sweeteners like desserts, pastries, ice cream, fried foods, white flour, white rice, white pasta, soda, and diet drinks. The authors also advise against the consumption of red meat instead favoring vegetarian sources of protein, as well as seafood. They also highlight the importance of healthy cooking methods such as steaming, baking, stir-frying, grilling, and broiling. Additionally information is provided about nutritional and herbal supplements that can assist in the management of inflammatory conditions. Salmon, flaxseeds, blueberries, raw almonds, mushrooms, broccoli, quinoa, Brussels sprouts, onions, chickpeas, lentils, black beans, tempeh, kale, cabbage, tuna, mackerel, chicken, eggs, low fat Greek yogurt, oats, brown rice, coconut, dark chocolate, green tea. Exercise can reduce inflammation, helps keep the joints moving and can assist with weight loss. If you are not currently physically active it is best to start with walking, which can be done outdoors or on a treadmill. Other physical activities that you could try include swimming, strength training, and yoga. You should aim for at least thirty minutes of cardiovascular exercise, three days a week and thirty minutes of yoga every day. 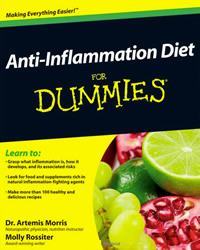 Anti-Inflammation Diet for Dummies retails at $19.99. Encourages the intake of a wide variety of unprocessed natural foods. Provides education about how to eat to reduce inflammation in the body. May assist with the management of health conditions related to inflammation such as heart disease, arthritis, allergies, and asthma. Gives tips on how to follow the program while eating out. Outlines a selection of nutritional supplements that may improve inflammatory conditions. Some of the recipes are high in calories. Recommends the intake of tuna and mackerel, which are high in mercury. Anti-Inflammation Diet for Dummies describes how inflammation can affect your health and explains how you should eat if you want to reduce inflammation in your body. This book also provides tips about lifestyle factors for reducing inflammation and a large selection of anti-inflammatory recipes.